Ginger crazy! Many Ed Sheeran fans were beside themselves seeing the singer in the flesh on stage this past weekend at FNB Stadium. 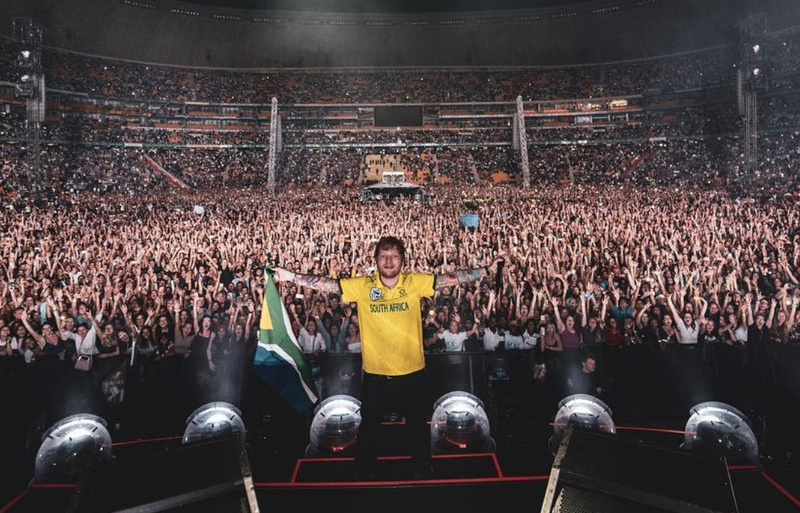 If you were on social media this past weekend, you would have noticed a flood of posts from South Africans who attended the Ed Sheeran concert at the FNB Stadium. Security was beefed up at the event, especially after the Global Citizen Festival chaos which took place last December and saw scores of concert-goers being mugged after leaving the venue. The Joburg Metro Police tweeted that they "deployed 114 Officers, 53 Traffic Wardens 47 Patrol vehicles & 8 Horses" to manage and control traffic within the precinct of the stadium. Now that the audience was safe, it was time for everyone's favourite ginger to rock out on stage, and boy-oh-boy did he come through. Social media was ablaze with many sharing pictures and videos of the singer performing, and the atmosphere seemed electrifying. Passenger and Shekhinah were the two supporting acts, and both of them took to social media to share their experience of opening for this global superstar. Passenger described it as "f*****g insane" and judging by the pics, we don't blame him for saying that. While Durban born and bred Shekhinah took the opportunity to thank God for the opportunity to perform on stage alongside Ed. And Ed? Well, he absolutely loves Mzansi, so much so that he even wore a Springbok jersey and even sneaked in a game of cricket, showing off his Protea Fire. He visited The Wanderers on Saturday to witness the final T20 between South Africa and Sri Lanka, and he looked like he had a ball. The next leg of the Divide Tour will take place on 27th and 28th March at Cape Town Stadium. Sky Tshabalala from East Coast Breakfast, alongside two winners, will be making their way to sing along with Ed. Make sure you follow our social media channels to see their journey unfold.